The cooperation agreement is in the framework to welcoming the delegation travel agents from Philippines to Vietnam in searching of promotional tourism opportunities, organized by the Vietnam National Administration of Tourism. The signing ceremony took place on November 11, 2018 with the participation of Mr. Ha Van Sieu, Deputy General Director of Vietnam National Administration of Tourism, HE. Noel Servingon, Ambassador of Philippines to Vietnam, and Mr. Trinh Xuan Tung, Head of Tourism Management Department, Hanoi Tourism Department. 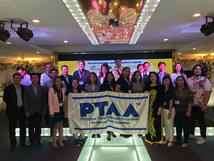 14 travel companies from Philippines and the alliance of six Vietnamese tourism companies (or so-called Vietnam Travel Group) including Tien Phong Travel, Vietcharm Tour, Hanoi Tourist, ANZ Travel, Postum Travel and VNA Travel were pledged to strengthen the corperation between the two countries in the field of tourism. "This event is a valuable opportunity for Vietnam Tourism Department to introduce attractive Vietnamese tourist destinations to Filipinos friends, opens up potentials and opportunities for exchanging visitors between the two countries in the future,” said Mr. Ha Van Sieu at the ceremony. At the event, the Ambassador of the Philippines also shared that he was surprised and fascinated with the beauty of nature in Vietnam such as Ban Gioc Waterfall in Cao Bang province, Halong Bay or Bai Dinh - Ninh Binh and hope that more and more Filipinos will know about such of these great places and come to visit in the near future. On the contrary, he also expected that there will be many Vietnamese tourists come to visit the Philippines in the coming years. Among 13 million international tourists to Vietnam in 2017, the number of Filipinos tourists ranked in the top 20, reaching the number of 133,543 visitors. In the first eight months of 2018, the number of Filipino tourists to Vietnam reached 96,893, an increase of 12% over the same period in 2017.